We had hydrangeas in our wedding. One of my husband's coworkers remembered that and thoughtfully clipped some of her hydrangeas for our first anniversary (which will be Monday!). Those are beautiful, you should dry them! I would love to dry them. Any tips to get them just right? 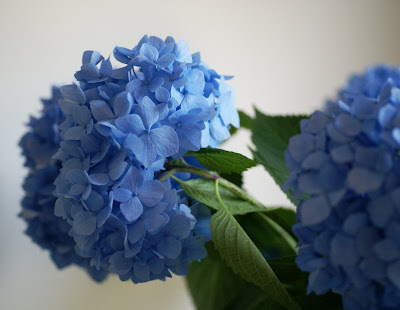 I LOVE hydrangeous also! Especially the blue ones. Hope you are able to preserve them for a long time. They are beautiful! Oh, WOW! Those are beautiful! 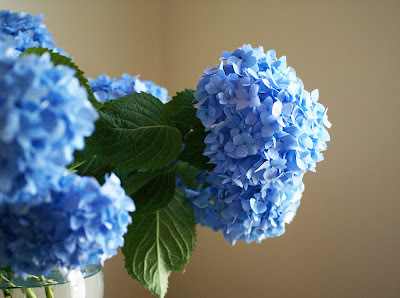 You might read up online about using desiccant to dry your hydrangeas. If I recall correctly, doing that will help them keep their shape and color. How beautiful! Hydrangeas have always been one of my favorite flowers. And since today is Monday (for four more minutes, anyway), Happy Anniversary! Oh my goodness! 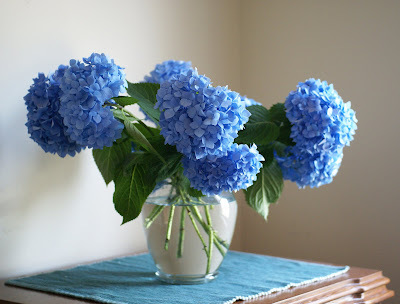 I absolutely LOVE Hydrangeas!! Hope to have a plant of my own some day...hmmm thats an awesome idea to have them in your wedding! Happy anniversary! Your Hydrangeas were breathtaking,we are doing a wedding in late November Boksburg,South Africa.Any idea where we might be able to buy some in S.A. Blessings on your beautiful wedding.